Germany has proposed a revision to its cultural protection legislation that would further restrict exports of objects more than 50 years old. While worries that it is the equivalent to state expropriation are overblown, it does indicate a mindset that is in many ways incompatible with the modern art market—even if it is only an effort to harmonize German and EU law. The struggles of Germany’s efforts to keep pace with other centers of art trade may only be compounded if this becomes law. It was my great privilege last year to speak at the 5th Annual Art Crime Conference, hosted by the Association for Research into Crimes Against Art (ARCA). 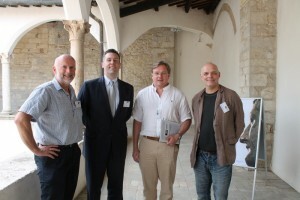 The conference, in Amelia, Italy, annually draws experts in varied fields of law, cultural property, archaeology, law enforcement, and more. It is also held in one of the most spectacular venues I have ever seen, a rocky outcropping , with a medieval Italian city on top of a Roman-era settlement (complete with a cistern at the top of the hill).